While the month of March absorbed Sudha with a host of activities, not so much on music, but otherwise, and for the causes, April was a mellow month – vacation time. But then, her music is omnipresent so can there be a vacation without music? The U.S.A beckoned Sudha and her daughter Malavika. Commencing with a fulfilling concert at San Diego on 5th April, the next stop over was at Cleveland for the Thyagaraja Aradhana. An addendum to her schedule this time was Malavika’s dance recital at Cleveland on 13 April. 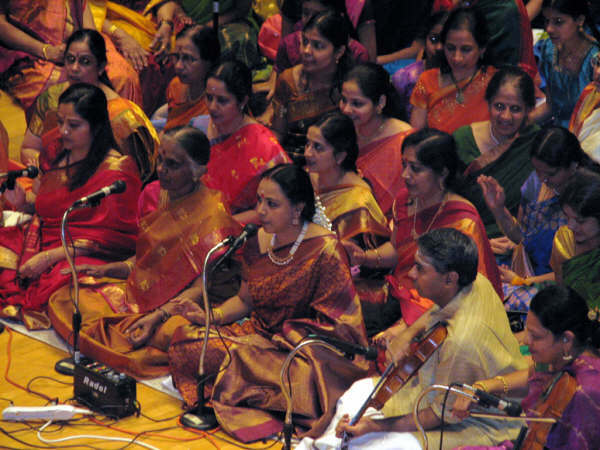 Sudha’s concert during the Aradhana was on 12 April. There were some special moments when, for a while, Sri V.P. 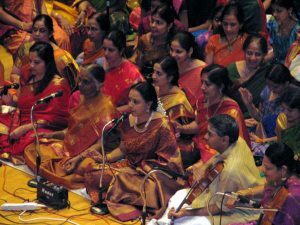 Dhananjayan accompanied Sudha on the thambura during the concert. What was special about the performance of Malavika Ragunathan, disciple of Guru Meenakshi Chittaranjan, was that the child danced to the tunes of her mother! Sudha sang, while watching with pride, the twinkling toes of her daughter! After having spent some time with her son Kaushik, Sudha moved on to another satisfying performance at Toronto on 25th April. The warmth and response received from her ever affectionate rasikas never ceases to amaze her- a sure tonic for continued rendering of spirited music. The month ended too soon for Sudha, when she had to pack her bags to return to home sweet home at good old Chennai….only to head for Norway the following month! !